Whoa, time has passed by really quickly. 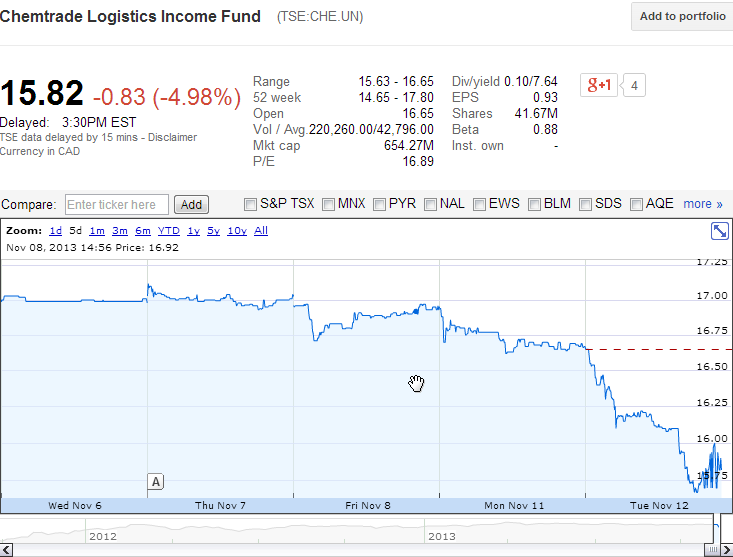 It’s already been more than a month since I sold out Chemtrade Logistics Income Fund (CHE.UN) from my TFSA. I sold out 1270 shares @ $16.96 with profit of $819.52 and collected $2287.00 in distributions. Commissions at Questrade were $29.49. This should have been $25.40, but Questrade charges extra SEC fees for the trades which I don’t like!! Luckily, I made the right move at the right time. For the past five days, Chemtrade has been trending downwards on news that Chemtrade is in talks to buy General Chemical Corp. Seems like traders are not liking this news and have been punishing the share prices. Anyways, if I had kept my shares of CHE.UN, I would be at a net paper loss of $433.54. Ouch! I still have 300 shares of CHE.UN in my margin account, but I bought it at a cheaper price. It’s still a hold for me, since they’ve been a steady income producer. Maybe, I’ll pick up some more shares at a discounted price. I would have to monitor they progress in the upcoming days. I replaced CHE.UN for Mastercard and First National Financial in my TFSA. Both stocks seem to be holding up well on their own thus far. By making the switch, I am improving the overall health to my TFSA.